I had a rash of bad days recently, and I kept stomping into the kitchen in hopes that food would make me feel better. We’ve all been there, haven’t we? I have a moderate sweet tooth, but my reasoning was that when people feel lousy and turn to food for succor, they don’t go for carrots or lettuce. They go for chocolate. Or ice cream. Or both. I pulled a recipe for chocolate cake from Food & Wine that’s actually quite fabulous when made in its entirety – it’s very much like a large Snickers or Whatchamacallit candy bar. It’s a bit too tricked out for a weeknight, but would be the perfect thing for a child’s birthday party. Anyway, the cake bit itself is perfection. Please don’t laugh, but in the same way that the Colonel’s KFC biscuits were the role models for my own, so is chocolate cake from a box, be it Duncan Hines or Betty Crocker, the muse for all my chocolate cakes. I’ve tried many a recipe throughout the years, all promising to be The Best. Some had mayo, some had espresso powder, others had full cups of coffee, and yet others combined cocoa powder and melted chocolate. None of them ever tasted like Betty’s or Duncan’s. Until this one. I made half the amount posted below and divided the batter into cupcakes because it would be easier to freeze the leftovers, but aesthetically, it’s not the best decision. The results are squat with square tops and in dire need of some cover-up (ice cream, anyone? 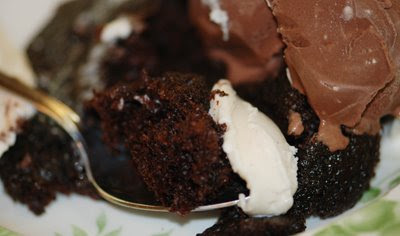 ), but looks aside, the cake is moist and dark and quite possibly the very cake that Ole Golly used to make for Harriet. If I like box cake so much, why don’t I buy it, you wonder? Because it’s full of preservatives and unpronounceable additives, silly. Also, this made-from-scratch cake can be pulled together in the amount of time it takes your oven to preheat. You can’t beat that. This is the adapted version, but for the whole shebang, visit Food & Wine. Makes one 9”x13” cake or 24 cupcakes. -Butter and flour a 9-by-13-inch cake pan or two 12-tin muffin pans – or line with paper cupcake liners and spray with Pam. -In a large bowl, whisk together sugar + flour + cocoa + baking powder + baking soda + salt. -In a separate bowl, whisk the eggs + milk + oil + vanilla. -Whisk the wet ingredients into the dry ingredients. Whisk in the boiling water. Pour the batter (it will be thin) into the prepared pan or muffin tins and bake for about 30 minutes, until a toothpick inserted in the center comes out clean. Cool.